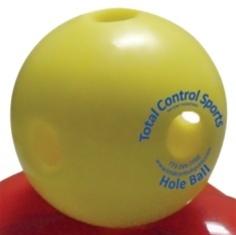 The TCB MINI Hole Balls are virtually indestructible golf ball-sized training balls. They are so durable that they are guaranteed for 1 full year from any breakage! They are also the only wiffle-style mini-ball that gives the hitter instant feedback. These lightweight training balls are a MUST HAVE for the serious Fastpitch or Baseball hitter and their teams. Don't waste your money on cheap store-bought plastic balls - invest in the TCB MINI Hole Balls that will last season after season!